Following a custom established in the 14th century, modern-day scholars display their academic achievements by wearing traditional regalia at the commencements and other important ceremonies. All of our university regalia strictly complies with the guidelines set forth by the Committee on Academic Customs and Ceremonies, appointed in 1959 by the American Council on Education. Other degree colors (such as nursing/apricot; library/lemon; theology/scarlet, etc.) are available but are not shown on the chart above for the simple reason that not all internet browsers can properly render all web colors. If you need to know the degree color for a degree not shown above, e-mail us. In addition to the degree colors, each school generally has its own school colors. If you know the colors that you need, be sure to let us know. Otherwise, let us know which school is your alma mater, and we will look up the colors for you. As each hood is custom-made according to your school colors, degree colors, and type of degree (BA, MA, or Ph.D.), we ask that you give us about 8 weeks to special make your hood, with the correct degree color on your velvet, and the correct lining color for you school. What if you don't have eight weeks to wait? 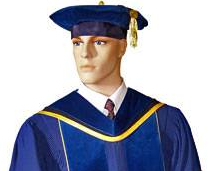 We accept individual orders for student's academic hoods and faculty hoods. We also offer quantity discounts if you are ordering several hoods at one time. To reflect the quantity discount, the price chart below shows the cost per hood based on the total number of hoods being ordered. and the VIP/souvenir hood for all VIP/souvenir gowns. These hoods are available with or without piping. Piping may be added on Ph.D. hoods for Ph.D. holders wishing to indicate their field of discipline or for people wanting to dress up their hoods. We recommend deluxe hoods for both deluxe and classic gowns. Classic and Deluxe Bachelor gowns would use the Deluxe hood, if required. 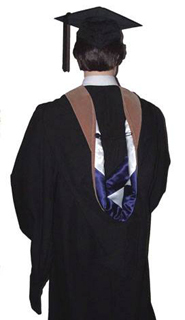 Unlike Masters and Doctoral Regalia, most schools do not require hoods for Bachelor's Regalia. Nevertheless, if you do need a bachelor's hood, we would be happy to make one for you. The price would depend on the type you selected. 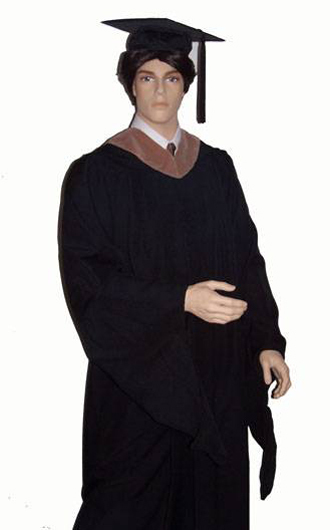 The cap and gown are in stock, but the hood takes 8 weeks to make. I need to march next month. What do I do? For customers who are in a rush, FacultyRegali can often often help you out with our free loaner hood program, as follows: Let us say that you want a Ph.D. Cap and Gown that we have in stock and can ship the same day. And you need to march in 3 weeks, but the color hood you need takes 6-8 weeks to make. What we can do is send you a substitute hood upon receipt of your payment. While this may not be the exact color you need, it is a lot better than not having a hood at all, and most people don't know the difference anyway. In the meantime, we can begin making your custom color hood. We send out your cap, gown, tassel, and loaner hood right away. You send back the loaner hood as soon as you are done with it, and then we ship you your custom hood for all future events. This arrangement has helped many faculty members who need hoods right away, but would prefer to have their own colors for the future. And we don't charge any extra for it either. In fact, if you are within USA, we don't even charge you anything extra to ship you the hood via UPS ground. If we can help, let us know.